David Robb and I wrote this book to show how difficult it is, especially for women, to break into the stunt business, and how easy it is to be broken by it. It’s a dangerous business. Women have gotten killed on the job, and many others have been seriously injured – some of them permanently. 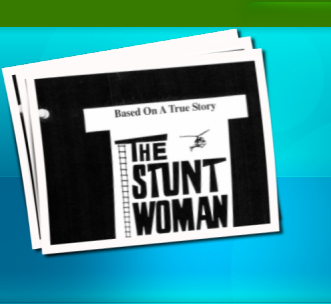 I know three stuntwomen who have committed suicide. Many others’ lives have been destroyed by drugs and alcohol. And yet, being a stuntwoman is the most exciting job in the most exciting industry in the world. Unfortunately, the stunt business is also the most sexist in Hollywood – an industry rife with male chauvinism. I spent most of my working life hanging from helicopters and hot air balloons, running on high catwalks, jumping across rooftops, falling down stairs, crashing through windows, turning over cars, being hit by trucks, and fleeing from fires and floods. I got concussions and fractured my neck, cracked my ribs, torn muscles and tendons, and I still have a dent in my head from being kicked in the head by a horse on “Little Big Man.” But the most dangerous thing I ever did was to complain about unsafe working conditions, and about the drug abuse problem that made a dangerous job all the more hazardous. Blowing the whistle cost me my career and livelihood. Drug users almost cost me my life. Discrimination is subtle and not always clear-cut. The old boys’ network is constantly lurking in the wings, in every position of the industry. Women are still vastly underrepresented in Hollywood – not just in stunts, but in all creative positions. It’s hard for anyone trying to break into the business, but for women, it’s even harder. You are judged more harshly, and you have to be twice as good as a man in your selected field. The longer the women in this industry remain silent, the more oppressed they will be. I realize that there are women all over the world whose lives are much tougher than ours could ever be. But pain is pain. Oppression is oppression. Not being able to be all that you can be is hell. If you don’t want us to care, don’t teach us to feel. The answer to nearly all the wrongs in the world is to put a woman in charge. Try it, you might like it. · And remember: for inequality to prevail, all that good men and women have to do is nothing. I always believed that if I took a grievance to my superiors, there would be an appropriate and considered response. I now know, however, that my commitment was shared by few others. It behooves all producers to speak in person to a stunt person if there is an issue. I figured that being labeled a troublemaker was a reasonable price to pay to make some changes. This led me into the world of the unknown, blacklisting, personal harassment and intimidation. Few people are prepared to handle retaliation, but I chose to take a stand and take any punishment they handed out. Sadly, except for a few brave souls, my friends and peers slowly disappeared. Life, as I had known it, was gone. If I had done cocaine with the “right people,” I’d still be working, or dead. I dug my own grave, but I did what I had to do. They can blacklist me, but they can’t kill my spirit…ever. I am hurt, but I am not slain. I will lie down and bleed for awhile. Then I will rise to fight again. These few words helped me get through some of the toughest times of my life. And yet, I hope and pray that my solitude will somehow bear fruit in the hearts of the very people who destroyed me. My father taught me to be brave, and to stand up for what’s right. So I wear my blacklisting like a badge of honor. This is 2012…where is our security of person? Without it, life and liberty are hopeless dreams, and hopeless dreams are not conducive to building better-educated and stronger stuntwomen. As long as management is false to their obligations, we are rendered unproductive. What a waste of important talent. To me, this is unspeakably sad. To the stuntmen, I say: Say what you will about me. Call me what you wish, but whether you like it or not, you are my brothers, and you taught me well. I have no ill will, just concern. But next time, just think with clearer minds before you decide to destroy someone. To all the producers, directors, actresses and crewmembers who applauded my work over the many years – I applaud you for your gracious help; your unmatched stamina in your chosen fields. You all inspired me. Thank you for letting me be me. And a heart-felt thank you to Jeannie Coulter, Leslie Hoffman and Jade David for not abandoning me. We share something in common – blacklisting. I would also like to thank David Robb, Kathleen Nolan, and posthumously, Norma Connolly. Lest we forget, all those in our industry who died, those who were injured beyond repair, all for the sake of the passion for their work…lest we forget. Mom and Dad, thank you for my life. Lily, you are always in my thoughts and prayers and tears. And finally, with this book, I lay down my sword. But if I have to, I’ll pick it up again.